The HopOp Light was designed with the intentions of capturing sunlight in a cylindrical shape that can be seen as a dot of light from space. The HopOp 500 is a great piece of street furniture that can be used for playing and jumping as well as sitting. The addition of the lighting element means play can happen even when it is dark outside. Available in four different colours (Red, Orange, Yellow and White) that can bring vibrancy both indoors and out. Adding light to the HopOp 500 includes a level of functionality often missing from external furniture, inviting users to rest and play during the dark hours. 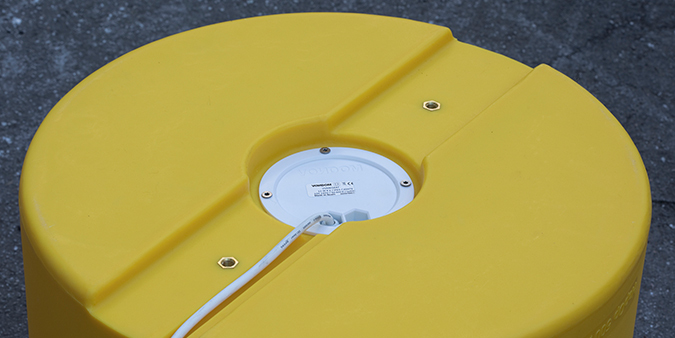 The HopOp is made from rotationally moulded polyethylene, making it a single structure. The plastic is UV-resistant and can stand up to harsh weather conditions. The surface has a granulated texture due to the abrasive blasting of the mold, enhancing the friction qualities, thus ensuring that the surface is slip resistant. The integrated LED-light unit is mounted within the cavity of the stool and glows through the translucent polyethylene surface, offering a uniform luminance. The polyethylene can withstands most cleaning agents and chemicals and can be cleaned using a high-pressure cleaner. The colour can also be revived using vinyl cleaner or similar products.